The African Grass Owl is a medium-sized owl with long legs and no ear-tufts. It is also known as the Common Grass Owl. Description: The facial disc is whitish-cream, with a thin yellowish-buff rim that is densely spotted dark. Eyes are brownish-black, and the bill is whitish to pale pink. The entire upperparts from the crown to the lower back and wing-coverts is uniform sooty blackish-brown, with scattered small white spots and greyish flecks. Primaries and secondaries are pale brownish-grey with darker bars and yellowish bases. The tail is short, with the central feathers uniform brown, and outer feathers becoming paler (almost white) towards the edges, and showing about 4 dark bars. Underparts are whitish to creamy-brownish with dark spots. Legs are feathered whitish to the lower third of the tarsi. The remainder of the tarsi and the toes are slightly bristled and coloured pale yellowish-grey. Claws are dark greyish-brown to blackish. Size: Length 38-42cm. Wing length 283-345mm. Weight 355-520g. Habits: The African Grass Owl is a nocturnal bird, rarely seen flying in the daytime. Roosts during the day on the ground in tall, often tangled grass. Domed platforms and tunnels are created by trampling down the surrounding grass. Tunnels can be several metres long and connect with other tunnels. A domed platform at the end of a tunnel serves as the nest or daytime roost. Paired owls often roost together and sometimes small parties may have roosts quite close to one another. This owl becomes active after sunset and hunts at night. If food is scarce, they may be seen flying in the early morning or late afternoon. 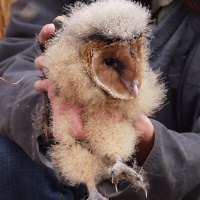 Voice: A screeching call similar to the Common Barn Owl, but less strident. A high-pitched sibilant tremolo of 1-2 seconds is thought to be the song of the male. 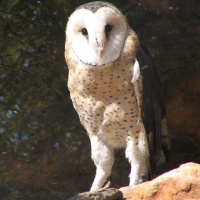 Hunting & Food: The African Grass Owl prefers rodents and other small mammals up to about 100g, taken from the ground. They may also catch bats, large insects and small birds in the air as well as on the ground. Normally hunts in a wavering flight low over the ground, listening and watching for prey, but will also hunt from a perch. Breeding: Breeds from December to August, but mainly February to April. The nest is a shallow hollow lined with grass at the end of a grass tunnel. 2-4 white eggs are laid, averaging 41.1 x 32.7mm, normally at 2 day intervals. The female incubates the eggs alone, while the male supplies the food. Incubation starts with the first egg and lasts 32-42 days. The young are fed by the brooding female using food brought by the male for about 10 days; thereafter, both parents feed the chicks. When the nestlings are about 4 weeks old, the female no longer roosts at the nest. At 5 weeks the young begin to wander around the nest, and then at 7 weeks they make their first attempts at flying. After leaving the nest, the young remain with the parents for about 3 weeks, before becoming independent. Habitat: Moist grassland and open savanna up to an elevation of 3200m. May also be found in dry grassland and at higher altitudes in Aberdares and on Mount Kenya in east Africa. In each case, habitat is normally characterised by long dense grass. 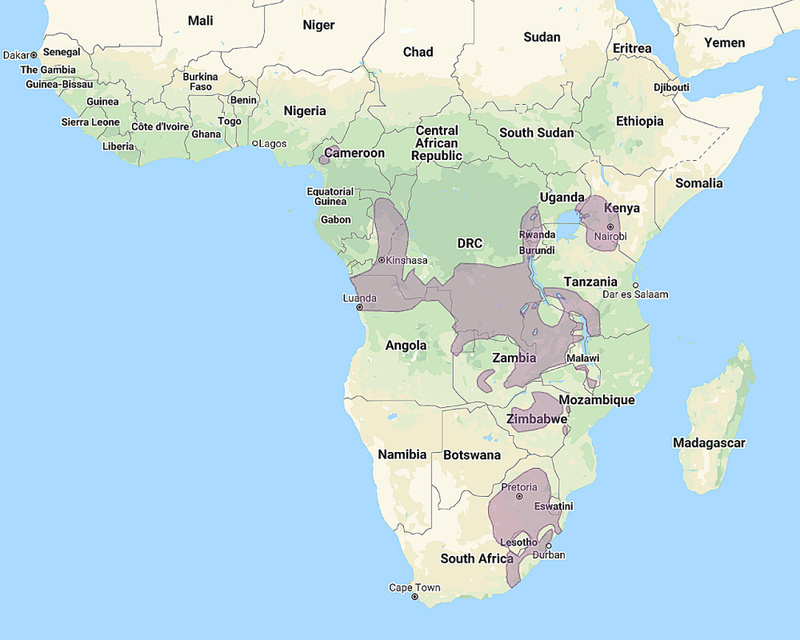 Distribution: East Africa from Ethiopian Highlands south to the Cape, and across south Congo to north Angola. There is an isolated population in Cameroon. Original Description: Smith, Sir Andrew. 1834. South African Quarterly Journal, Vol. 2, second series, No. 4, Part 1, p 317. Borrow, Nik & Demey, Ron. 2001. "A guide to the birds of western Africa". Princeton University Press. See also: Other owls from Africa, Genus: Tyto.